Hard work, patience and dedication are the traits of any successful entrepreneur. They choose an industry or a domain that interests them the most and make the best possible use out of it. One such domain is that of running an online micro job platform, where small tasks, or services are sold and bought. Such tasks will be completed at a minimum price, say 5$, by the virtual employees. Also known as gigs, these small tasks range from designing a logo, writing content, helping to write a resume, creating a video, etc. Such kind of online job marketplaces are becoming famous these days, especially among employees wishing to work from home. And for aspiring entrepreneurs planning to join the small list of entrepreneurs who tasted great success financially by launching a micro jobs platform, it is important that they select a micro jobs script that is best is various factors and aspects. 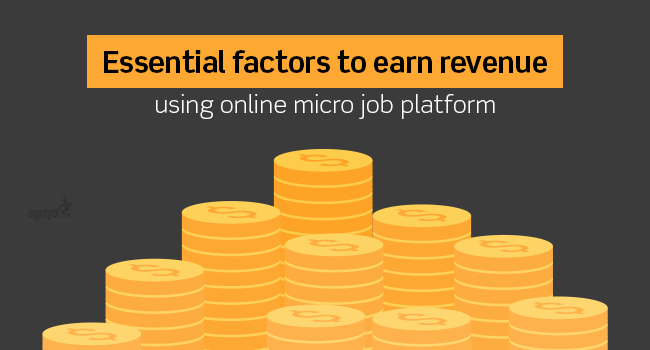 Here are the few essential factors that decide how much revenue you earn using your online micro job platform. Having a revenue model that fetches you good income by running a small jobs website is important. You should consistently make money. Numerous revenue generating options include charging a certain amount for listing the jobs on your platform. The micro jobs script which is a Fiverr clone has got numerous revenue generating options like Gigs commission, ad-captcha and ad-banner which can help you make huge revenues. Did you know that modern features can boost the credibility and popularity of your micro jobs platform, and thereby lead to more users using your website? Yes, it is a reality. Cutting edge features will create a ripple. Their impact falls on your revenues as well. It is hence important for you to have features like Internal message board, Multi-currency support, Social media logins, Featured jobs listing, all boosting your website's performance, credibility and revenues. Having multiple payment gateways integrated is important. That too, having it integrated via an abstraction API will prove to be advantageous. Significantly, you can notice growth in your platform's conversion rate. Thanks to the multitude of payment gateway option you offer your micro job platform users. Taking your small tasks website far and wide is mandatory for you to earn big profits. This is where affiliate module comes into the picture. Picking a script which has affiliate module integrated is important. Fiverr clone has got this option. Any website can become your affiliate and can drive traffic to your site. Advantage? It is that more potential employers and employees register on your website and take part in it, boosting your revenues. As the online gig economy is growing by leaps and bounds, entrepreneurs can take advantage and scale great heights by making substantial profits. However, aspiring entrepreneurs can also look to starting niche micro job websites and explore the unexplored paths.